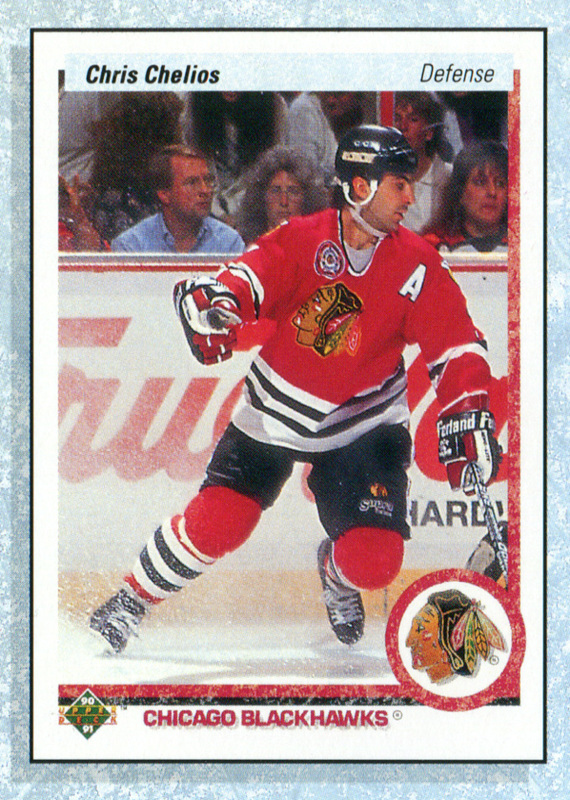 This card hints at what Chris Chelios’ 1990-91 Upper Deck Update card could have looked like. 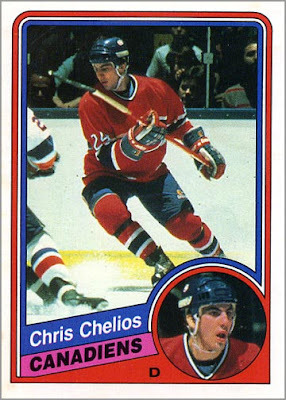 You might recall that Chelios’ card in the regular set (#174) pictures him with the Montreal Canadiens. 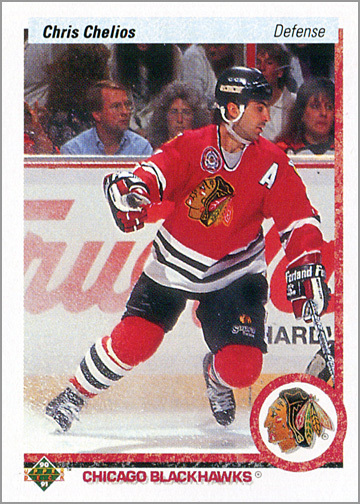 The card in the Update set (#422) shows Chelios in a white Blackhawks jersey. So, where did this card come from? 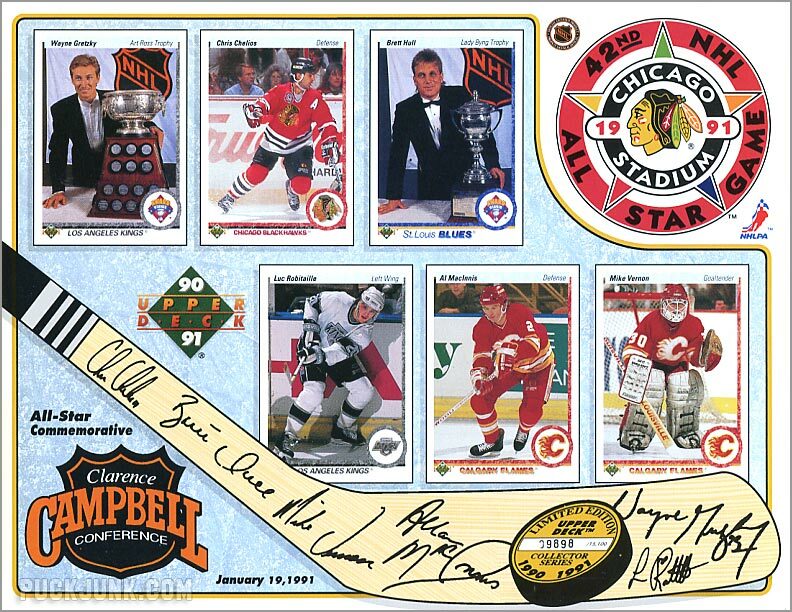 At the NHL All-Star Game, held at Chicago Stadium on January 19, 1991, two Upper Deck commemorative sheets were given to fans at the game. 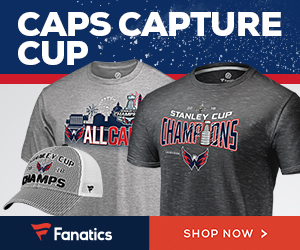 One was for the Wales Conference starting lineup and the other for the Campbell Conference starting lineup – the home team of the All-Star Game. 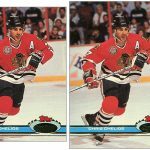 Upper Deck used scaled down images of their hockey cards from that season to show the starting lineups, EXCEPT for Chelios. 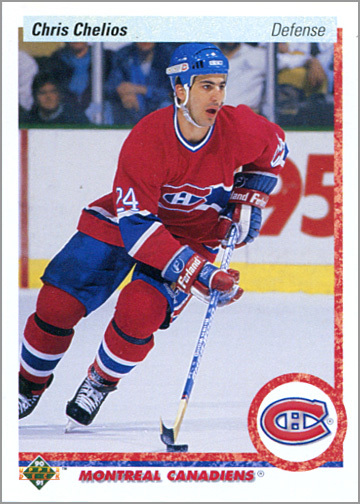 Chelios’ Upper Deck card showed him with the Montreal Canadiens. So, using a picture of this card wouldn’t make sense to put on the Campbell Conference lineup sheet. It would have also been a bit insulting to us ‘Hawks fans at the game, which was pretty much everyone. 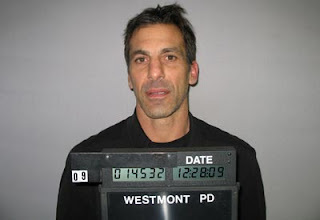 Chelios was born in Chicago, and an instant fan favorite the moment he first stepped on Chicago Stadium ice. So, Upper Deck “made” this “card” to put on the Campbell Conference commemorative sheet. 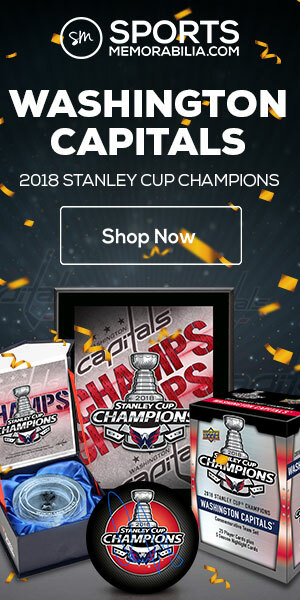 Keep in mind that these were released at least a month before the Upper Deck Update set. 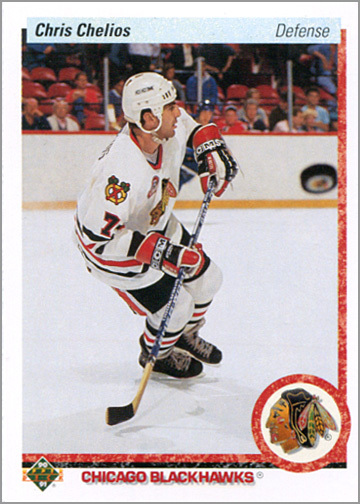 When I was a kid and first saw this, I assumed that this was what Chelios’s Upper Deck update card would look like. But when the Update Series came out, it used a different photograph, and I was disappointed. 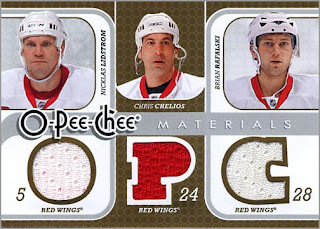 Personally, I like the “red sweater” photo better, and wish that was what Upper Deck used for Chelios’ update card. The photograph is more action-oriented, and the red (at the time) road jerseys always looked so much better. But back in the 90’s, home team wore white and maybe Upper Deck felt that fans wanted the home team shot instead of the away. The back side of the update set does picture the away jersey. Just a guess anyway on why it didn’t turn out the way it should have, but if you ask me I am very glad dark jerseys became home jerseys! Thanks for the proofread, Al. I’ve corrected my mistake. I was at the all-star game in Chicago on January 19, 1991. I still have both Upper Deck commemorative sheets, in perfect condition. Do you have any idea of what they may be worth? Thanks for your time. I was at that game too! It was an awesome experience! Those sheets usually sell for around $5 or $10 each. 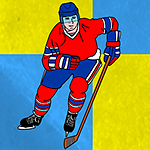 Thanks for the info….. Not only was the all-star game great, the skills competition the night before was terrific too. 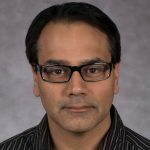 Out of curiosty, are you from the Chicago area? Yep, from Chicago. The Skills Competition and Heroes game the night before were more exciting than the All-Star Game itself (other than the player intros and National Anthem). After that game, I bought frames — one black, one white — for the two All-Star sheets and hung them up in my living room.